We noticed yesterday that the full-screen map display in our 2017 Sorento SXL wasn't showing the time. Switching to the home screen, the time shows as '--:--'. In Setup->Clock, GPS Time is turned on; all the other controls are greyed-out. Turning GPS Time off and on doesn't change anything, and there doesn't seem to be any way to manually set the time, even with GTP Time off (because what I think is the control to get to the setting screen is in-op). The rest of the GPS functions seem to be working properly -- the car knows where it is, and tracks properly on the map. Looking at the GPS status from (if I remember correctly) the Setup screen, it shows lots of satellites in range, but the time shows as sometime in 1969, which I think is the beginning of the time epoch, and means that the clock has a zero value. Anyone seen this? Know how to recover? We find we really miss having the time display. GPS just in the last few days hit a y-2k type problem (count of weeks overflow) that affects older/not updated units. Hard to believe since earlier and later models (nor even any other 2017 heard here) aren't having this issue, but it sounds like you hit a code regression in your particular device. Your symptoms could indicate a rollover failure on 6 April. That one device 'out of the middle' of so many would experience this is pretty amazing. In your case, it might be of interest to completely kill power to the head unit (and hence, the GPS) for a period of some minutes, and force it to re-awaken and reacquire the almanac. Can take anywhere from 10-20 minutes in a 'clear' sky. Will be interesting to see if re-acquisition of the ephemeris data has any impact on the date/time calculation. It may be that the rollover itself failed, but that the firmware will correct that when it sees a time beyond that of the rollover moment. Just to be clear, the device IS correctly obtaining a fix for your position, yes? Yes; the device knows where the vehicle is, and tracks properly on the map. The only thing missing is the time. So is your suggestion to just disconnect the battery for, say, half an hour, and then re-connect? Or better to pull an appropriate fuse? Any issues from disconnecting the battery for a while? Last edited by SteveBurling; 04-11-2019 at 04:36 PM. I'd go ahead and pull the appropriate fuse rather than the battery cable. That will avoid resetting anything else that depends upon unswitched power. I don't know how long certain items (e.g., power seat positions) are held when there's no battery available at all. Only pull the one for "Multimedia". It's a 15A fuse. I pulled the fuse (fortunately, I'd read the owner's manual and knew there was a fuse puller under the hood -- those things are tiny). I let it sit for a few minutes, so the electrons had a chance to run out , put the fuse back, and voila, the clock was there again. The GPS hadn't lost the satellite info, either. P.S. 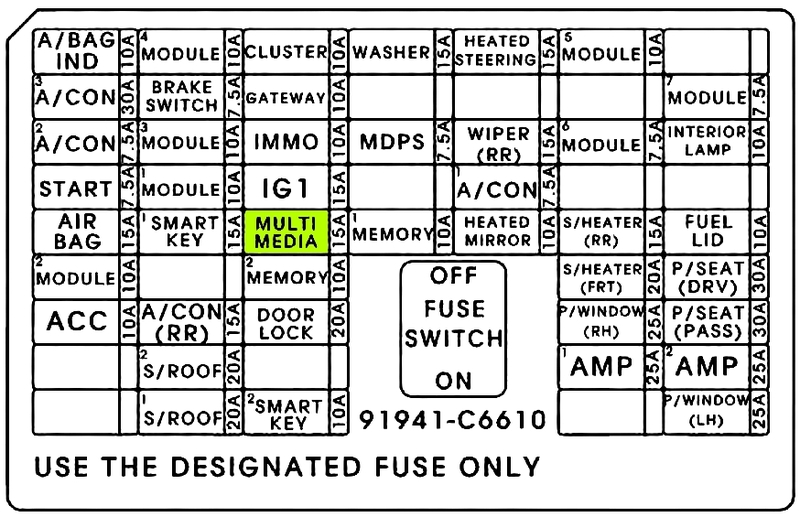 Man, this car has a lot of fuses... I was glad for the chart on the cover (and in the manual). Good to hear you're back 'in sync'. Odd that the firmware seemed to glitch at the transition of the rollover, but can handle the rollover after the fact.